Thank you to everyone who came out to ORD yesterday to support AFA Air Wisconsin Flight Attendants! Almost 100 people demonstrated to pressure Air Wisconsin management and United Airlines to negotiate a fair contract. 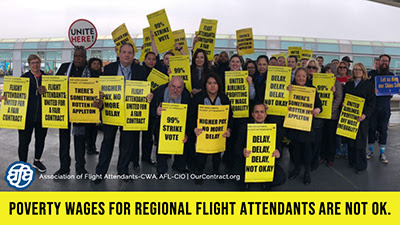 Air Wisconsin Flight Attendants were joined by Flight Attendants from United, Frontier, Spirit, Envoy, AFA International Officers, UNITE HERE!, CWA 4900, ALPA, AFGE, DSA Fox Valley, NABET, UAW, Chicago Federation of Labor, Chicago Airport Police, and even passengers. Look out for information for the next picketing event at Dulles (IAD) in May. Contract Now!